If i export in ASCII FBX 6.1 my model lost uv coordinates and model are displayed without textures in other programs. If I export ASCII FBX 6.1 I can see a LayerElementUV and corresponding stuff in the exported file. Could you be more specific in regards to which 'other programs' have trouble importing those UVs? Do they report any (error) messages whatsoever? You can try May maybe there will be it the same way. I tried the trial 3d 3d 2015. Only the binary FBX works fine, but it does not exist in the blender. Old 3ds max no show uv in text fbx. 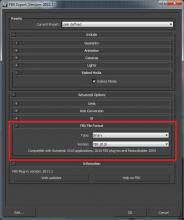 (3DS max 5.0 ) for example. Where can I write a request to the developers about adding some sort of feature? For example, what function is not described now and that its developers have created in a blender? Just tried Maya 2016 and Unity 5.4 and UVs come over without problems in ascii fbx. 3Ds max 5.0 is more than 15 years old, I think there is nothing we can do on our side to support something like this. Again, was there any (error) message upon import? yas 3ds max 2015 normal import. Many programs have binary export in the old format. 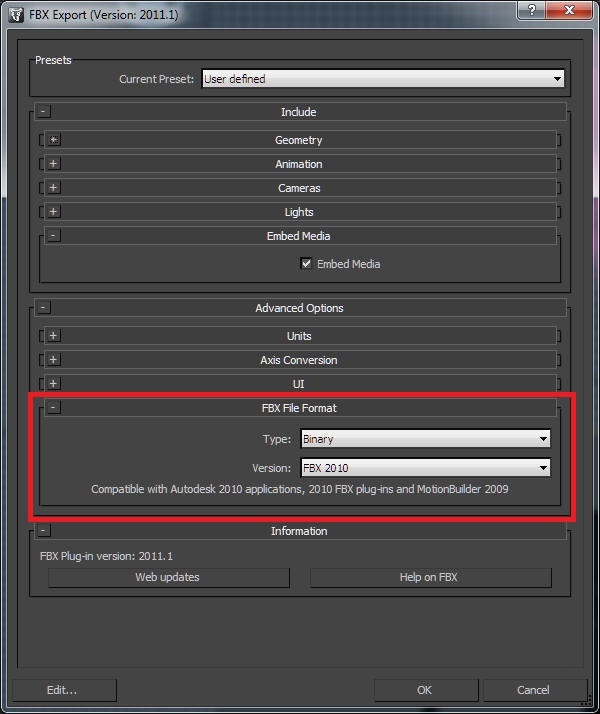 Look at the export to maya in fbx, there you can choose the version (2009fbx) and type Binary and ASCII this job for all version. You need to create a binary type and version 6.100 instead of a textual one like now. This can be done ? In this lmage set Banary Type And Version 2010, Versions until 2009 in old programs work correctly but only in binary form. Will let @Bastien Montagne (mont29) have a (final?) word on this. blender is not using Autodesks FBX SDK (iirc for legal reasons - free but not opensource...) but instead something that is reverse engineered. So it is not as easy as changing a preset/option unfortunately... Supporting every flavor of FBX is therefor tedious and timeconsuming. Can this be done? Probably yes. Will it be done? I have my doubts. But like I said: lets see what Bastien has to say. Another such question is not to create a separate topic. How can I add my own image format to the blender? If I want to display textures in my format in the scene? There is an addon on the python for importing, exporting geometry, but I did not find how to connect the image format. Please stay on topic. That would be a support issue and not a software error we can investigate. Note that I'd propose to remove this exporter: T53877 since binary FBX is much better supported now.